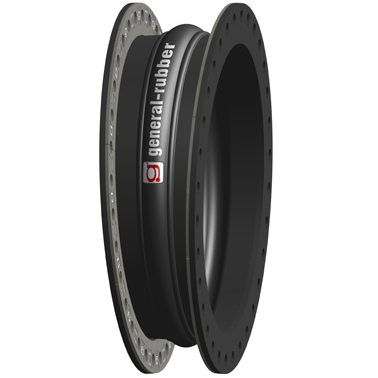 General Rubber's Styles 1101AO and 1201AO rubber expansion joints are designed with built-in angular offsets to accommodate non-standard field conditions. They provide ease of installation without compromising any performance capabilities. Additionally, they are designed to absorb large all-directional movements, reduce noise and vibration, have a cycle life in the tens of millions, compensate for misalignments, provide access to piping and equipment and relieve pipe and anchor stresses. Its spool type body is constructed with full rubber flanges, a high-grade leak-proof tube, multiple layers of high-strength tire cord, high tensile steel reinforcement, a seamless cover and hot dip galvanized steel retaining rings. This construction, as a standalone expansion joint, represents the most cost-effective arrangement when used in rigid piping systems with main anchors (MA) and numerous guides at specific spacing. Control units can be externally or internally attached and used as limit rods for secondary restraint or as tie rods when the support structure or adjacent equipment have load limitations. General Rubber's Styles 1101LO and 1201LO rubber expansion joints are designed with built-in lateral offsets to accommodate non-standard field conditions.